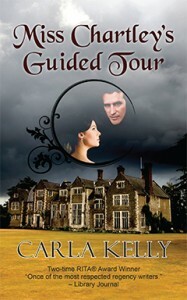 Miss Chartley’s Guided Tour ($13.95, 250 pp., ISBN: 978-1-60381-913-8) is Camel Press’s latest reprint of popular regency romances by Carla Kelly. First published in 1989, the novel features a gentlewoman of reduced circumstances whose luck changes when she helps an abused runaway. Carla Kelly is the recipient of two RITA Awards from Romance Writers of America for Best Regency of the Year; two Spur Awards from Western Writers of America; a Whitney Award for Best Romance Fiction, 2011; and a Lifetime Achievement Award from Romantic Times. Kelly’s Mrs. Drew Plays Her Hand reprint was selected by Publishers Weekly as one of the top 5 romances in 2012. In coming months, Camel Press will also reprint Miss Billings Treads the Boards, With This Ring, Miss Milton Speaks her Mind, and McVinnie’s London Season. Camel will also be publishing Carla’s all-new Spanish Brand series. Book 1, The Double Cross, will be released on August 1, 2013. “All of Kelly’s characters shine, from her hero and heroine down to the smallest child,” wrote All About Romance. “Well-written, well-plotted and retains its original charm. Omega is independent and strong for a Regency heroine. Once Matthew sheds his demons, he becomes a hero worthy of her.” Read more …. To all appearances, Miss Omega Chartley is a schoolteacher on holiday. In fact she is a gentlewoman fallen on hard times, left at the altar eight years earlier and forced to make her own way in the world after the loss of her family fortune. Omega’s modest tour of England is cut short when she comes to the aid of a runaway. Jamie Clevenden has fled the clutches of a brutal uncle, and Omega is determined to help him escape the law, as represented by Bow Street Runner, Mr. Timothy Platter. Aided by a kindly war veteran and his adopted daughter, the two fugitives arrive at the home of Jamie’s other uncle, the Viscount of Byford—none other than Miss Chartley’s disgraced fiancé, Matthew Bering. There Miss Chartley will finally learn the secret that Lord Byford has hidden from her all these years, the story of a dark chapter in his past that stands in the way of not only their happiness but that of his nephew. Now they must face the truth together, no matter how dire the consequences. A well-known veteran of the romance writing field, Carla Kelly is the author of twenty-nine novels and four non-fiction works, as well as numerous short stories and articles for various publications. Carla’s interest in historical fiction is a byproduct of her lifelong interest in history. She has a BA in Latin American History from Brigham Young University and an MA in Indian Wars History from University of Louisiana-Monroe. Click here to find Carla online. She tried to think what to do. The only other recourse was to apply to Matthew Bering, Viscount Byford, for a loan. “Oh, God, I cannot,” she said. Omega jerked her hands away from her face and opened her eyes. Matthew was standing quietly in the doorway. He was dressed carefully in the elegance of a country gentleman again, stock neatly tied, coat smoothed across his shoulders without a wrinkle. He walked slowly to the other end of the table and sat down. “Cannot what?” he asked again when she did not seem disposed to reply. He was teasing her. There was a twinkle in his eye as he leaned back in the chair and regarded her. He was playing with her emotions like a musician with an instrument. How dare he? She rose to her feet slowly, horrified by the intensity of her rage. Had there been a pistol within easy reach, she would have shot him. She could think of nothing that would do justice to her feelings. There weren’t enough words in the language. She could only shake her head and hurry to the door, desperate to get belowstairs again. There was another look in Matthew Bering’s eye that she couldn’t identify. A chill settled around her heart. She got to the door first and stepped into the hall in time to narrowly avoid Twinings, who was hurrying to the front door. Hugh had returned. Thank God. That would be sufficient diversion to allow an escape. Besides, there was much to do belowstairs. Omega Chartley chose discretion over valor, and fled to the safety of the servants’ hall.